Pope Francis holds a bracelet given by a young person as he arrives at Tocumen International Airport in Panama City on 23 January 2019. Photo: CNS/Paul Haring. Archdiocese of Perth Content Producer Josh Low writing for The Record Live from Panama. Some 75,000 people, including young people, priests, and bishops came together for the Opening Mass of World Youth Day (WYD), celebrated by Archbishop of Panama City, Mons. José Domingo Ulloa Mendieta OSA. In his homily, the Archbishop of Panama City thanked those in attendance for accepting the call to join the WYD celebrations in the country. “We are the first Diocese on the ‘Tierra Firme’ (mainland), and from here, the Gospel radiated to the rest of the Americas, always under the protection of the Blessed Virgin Mary, the Mother,” he said. “Let us give thanks to God for allowing us to be the host of the first World Youth Day where Mary, “the star of evangelisation,” has been proposed to you as the model of bravery and courage, who was available to do the will of God for the project that she was chosen to do, and whose response is the theme of this WYD. “The Blessed Virgin Mary, the young lady of Nazareth, is a trustworthy model to follow because of her openness and service to the will of God. It was that young woman who dared to give her YES to the plan of God, without fear, despite what it implied, in the midst of the risks that this meant in those moments. “But regardless, she said yes, because she knew the promise that God made with his people, that he would send the Saviour,” he said. Pilgrims prays during the opening Mass of World Youth Day in Panama City on 22 January 2019. Photo: CNS/Jaclyn Lippelmann, Catholic Standard. Archbishop Ulloa followed by calling the youth to be open to hearing God speak through the many catechesis sessions, testimonies, youth festival and the Sacraments. “We know that just as in Jesus’ times, young people search for witnesses, references filled with content and experience, who have walked the path by foot, with mileage, and not an intellectualized or thought-up God. The Archbishop added that in the eyes of Mary, each young person can rediscover the beauty of discernment; and in her heart, experience the tenderness of the intimacy and courage of her testimony and her mission. Pope Francis holds a bracelet given by a young person as he arrives at Tocumen International Airport in Panama City on 23 January 23, 2019. 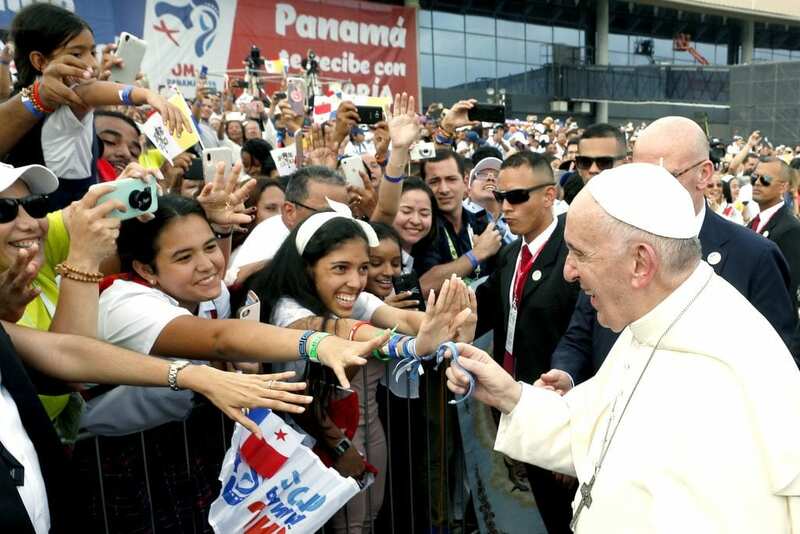 The Pope is visiting Panama for World Youth Day. Photo: CNS/Paul Haring. He concluded by calling for young people to live for becoming saints, referencing the lives of the patron saints of WYD. “Being a saint is not a myth. It is a tangible reality. All of them show us that a life of holiness is possible in every culture and ethnic group, without distinction of gender, nor age. “The generous self-sacrifice of their lives for God and their neighbour made them reach holiness. “Do not fear, dear young people, have the courage to be saints in the world of today. Do not renounce your youth or your joy with this,” he said. “On the contrary, show the world that it is possible to be happy with so little, because Jesus Christ, the reason for our joy, has already won us eternal life with his Resurrection. “I invite you to be open to live, from this moment on with humility and availability of believers, this historic experience on this Panamanian Isthmus, where faith arrived more than 500 years ago. “We hope that today you can say at the end of WYD that we have sent new disciples of Jesus Christ to the world to radiate the joy of the Gospel throughout the world. The Gospel of mercy and the love of God,” he concluded.